Factoid # 46. William Birtch (Birch) was the 5th of Robert Birtch’s six sons. Robert, a Richmond merchant and innkeeper, worked to ensure that all his sons had the opportunity to do well. 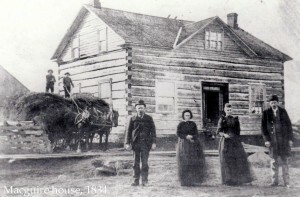 William gained possession of lot 12 on the east side of McBean St. and lived in a one storey sided log house situated on the north side of York St. along the river and beside the bridge. In 1851 the “Province of Canada Directory” listed William’s hotel as “A Temperance House”. This is very early to be part of an organized temperance movement in Ontario and a year later the census records him as having a tavern. So at this point it is unknown whether his temperance hotel was based on ideology or just his lack of a license to sell alcohol. At this time, William shared the house with his wife and 3 small children so it’s also unknown whether his “hotel” was a part of his house or some type of add-on. William was also listed as a cordwainer. On the 1861 census William now a father of six called himself a storekeeper. However on the 1863 Walling Map his home is labelled “Travellers Rest” so it seems he was also still running a hotel. None of his endeavours was prosperous and he soon moved to western Ontario and then to Manitoba. Factoid # 47. The term cordwainer is frequently used in Richmond to identify shoemakers. There were several other cordwainers in the village as the wet and muddy conditions faced by migrant teamsters, local farmers and villagers created an ongoing demand for new footwear made from new leather. The compilers of gazettes and directories, which were published in Montreal or elsewhere outside the community refer to the cordwainers as shoemakers. In 1905 the Carp Review published an obituary for Mrs. Constantine Maguire (McGuire) who had died at the age of 93. It stated that she (Frances) had lived in the same house for 71 years. That dates the construction of the building before 1835. That house, clad in white siding, still stands on the northwest corner of McBean St. and Burke St. It was originally a one-storey log house. At some point the roof was raised and it became a one and 1/2 storey building as seen in the picture at the left. Here Constantine and Frances raised 14 children; Constantine farmed and was also a cordwainer (shoemaker). In the first years Constantine farmed his own lot, which had been originally granted to his father, Cornelius. In 1844 he obtained 3 park lots (each 10 acres) on King St. By 1861, the year Constantine died, the census shows that he owned 62 acres, which had yielded 1100 bushels of grain. His four cows had provided milk for his family and 60 pounds of butter. He had sheep and pigs that produced 20 pounds of wool and three barrels (20 lbs. each) of pork. Frances continued to live in the house with two of her children until her death. Factoid # 49. In 1861 Constantine McGuire was the only Richmond farmer to grow mangel wurzels. What was a mangel wurzel? 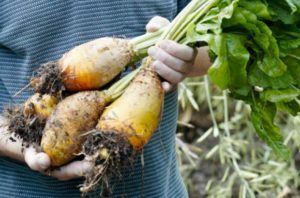 It was a type of beet, which was often yellow in colour and looked much like a large misshapen carrot or an elongated turnip. A nutritious root vegetable it was used as food for livestock but both the leaves and root (especially from young plants) could be eaten by humans. This vegetable was not unknown in many parts of the area. For example 200 bushels were produced in Nepean. It was a specific crop enumerated by census takers. Not a popular crop in Richmond, or in Goulbourn, W. H. Smith in Canada: Past, Present and Future reported that in 1850 no mangel wurzels were grown in either. Factoid # 50. If Richmond gardeners didn’t grow mangel wurzels, what crops did they prefer? POTATOES. In 1850 Smith reported that in the previous year 4941 bushels of potatoes were harvested in Richmond. This was at a time when the population of the village was only about 430. Potatoes were equally popular in the rest of Goulbourn where 48887 bushels were produced. Statistics were only provided for a selection of crops but of those listed, the second most common vegetable in Richmond gardens was peas (526 bushels), followed by turnip (100 bushels) and Indian corn (40 bushels). There does not seem to be a statistic for onions, carrots, beans or cabbages, which were also common at the time. This entry was posted in industry, merchandise, Personalities. Bookmark the permalink. Fascinating and very informative Factoids of facets of 19th life and inhabitants of Richmond – a great bicentennial series.